What's that? 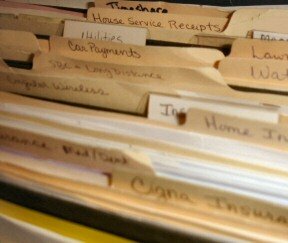 You don't really have a home filing system? You're not even sure what it is? A home filing system is an organized manner of keeping track of all the paperwork and information that our lives generate. 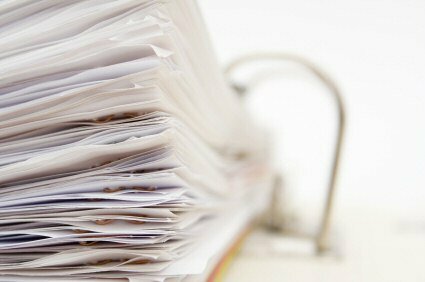 The main goal of this system is to allow you to find documents when they're needed without wasting time or digging through mounds of paper. You can set up your filing system to manage the basic necessities of keeping track of bank accounts, bills, insurance and those types of essentials. Or you can go gung ho and organize and file everything in your life down to your hobbies, holiday greetings lists and magazine subscriptions! In addition to how detailed you want to get, it's up to you exactly how you choose to file all of this information. Don't let anyone tell you that one way is "the way". As I've stated before, we are unique individuals and what works for one person may not work for another. So find a home filing system that works for YOU! You can use a filing cabinet or other type of filing box, plain or fancy file folders, accordion folders and notebooks just to name a few. If you can, start early to manage your paperwork. It amazes me how much documentation four people can generate! When I was single, it wasn't a big deal. I had a large accordion file that held most everything. When I got married we had to try to combine our filing systems and methods. And now adding kids, our paperwork has expanded too! So the sooner you get yourself organized, the easier it will be to manage it in the future. A little time spent now will save you time and sanity in the long run. You need to have your current files accessible for daily use. If you can't access them, you won't use them and you'll continue to have piles of paper to put away. Your current files include a system for organizing unpaid bills, paid bills, current bank statements, tax receipts and papers for the current year. Other documents you need to keep easily accessible are employment records, credit card information, insurance policies, copies of wills, family health records, appliance manuals and warranties, educational records, social security and pension plan information, inventory of the contents of your safe deposit box at the bank, a household inventory , and an inventory of important family papers. Your archived files include things that you don't need to access often, but that you need to keep on hand. They include past tax records, copies of valuable papers, information that you may need in the future regarding marriage, divorce, military, home ownership and things such as that. Something else to think about these days is that your home filing system could include your computer. Some of the filing categories are actually things that I know I keep on my computer, such as addresses. These files shouldn't be forgotten. And they should also be backed up regularly as well. You should also consider backing up to disk and storing it in your safe deposit box. Click here for more information about organizing your computer files. As I mentioned earlier, you can just file the most important categories, or you can file everything you own! To get started though, we will only work with the basic necessary categories for most households and work on our active files. 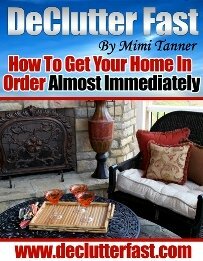 Click here for a complete list of categories for your home filing system, or go to the checklist library. You may not need to use all of these, or you may have other things to add that are pertinent to your current life situation. Also, you don't need to organize them in exactly these categories. For example... you can put car insurance with your other car papers, or you can put it with all other insurance papers. Some of these things can be in file folders, and others, such as medical records, may be in a notebook, or addresses may be in a computer file. Do what works best for you! Just know where things are, and make sure your family also knows where to find things. One last thing before you get started is to know how long to keep your records . Don't let the list of potential filing categories frighten you and prevent you from even getting started. First, get all your materials together... your file box, folders, labels, pens, paper or whatever you decide to use. Next, make a list of a few of the most important items on the list, probably the things from your active files (tax receipts, unpaid bills, paid bills, bank statements, credit card information, medical records and receipts...). Then, do one item on the list at a time. Label that folder, fill it with the documents, file it in the container, and write the file name on your master list of the files you've made (your future "table of contents"). You will probably be done before you know it. Or, if you choose, you can break this task into sessions of an hour or whatever works best for you and complete it over a few work sessions so that it's less overwhelming. And remember... it doesn't need to be beautiful or perfect (look at mine). It just needs to be functional for YOU! And if you can afford the time and money to make it beautiful as well, then by all means, go for it! Set up a financial plan that works! Learn how to organize your bills, plan a budget, get out of debt, and start saving at Get-Organized-Mom.com! For additional information regarding specific portions of your home filing system, see the categories below.